In this presentation, I will first address some ideas about the role of the artist, with emphasis on the artist as researcher. I will then utilize my installations, from two concurrent exhibitions: Ancestral Confessions: Historical Evidence of A City and Keeper of History – Holder of Dreams both from 2006, to exemplify the methodology and out-come of my en-deavors. One function of the artist, like that of the archeologist, is to investigate meaning and offer a reconfigured perspective on what has been left behind. My interest in our cultural and spiritual roots comes from a belief that they are charged with a vital energy. This energy can inform our decisions and help us embrace a more meaningful future. As such, I offer my artistic works as visual stories linking us to our past and projecting visions for what can be. An aspect of most artistic endeavors, like that of any exploration, is research. Research is based on investigation and aimed at discovering and interpreting human knowledge. Artists research their craft. Likewise, they formally or informally study their art conception, including the content and message they want to convey. For artists, whose work is focused on reconceptualizing the past, research is particularly important. There are many sources of cultural remains. For example, oral histories capture the unique emic perspective of our elders and reconfigure etic interpretations. Or think of the energy emitted from artifacts such as bones or stones, well shaped and polished three thousand years ago. Researching cultural remains can take many forms: experiential, observational, or empirical. It can entail conducting interviews, listening to oral histories, remembering experiences, searching in archives, following the meaning of an object to its source, or scientifically validating information. The researching skills of the artist may be as much based on intuition as academics. In fact it is often the inspirational aspects of research that provide creative interpretations. In addition, the manner in which the artifacts, the stories are put together needs to have not only an intellectual but also an aesthetic sensibility and intention. The art conception and product need to enhance the story being told and become part of the meaning. In 2006, shortly after a fire in my studio in New York City destroyed about a third of my works, I had the opportunity to function as Artist in Residence at the Museum of History of Ponce and develop the exhibition Ancestral Confessions: Historical Evidence of a City. Although reconfiguring history had been an important aspect of my artistic interest for some time, the fire en-han-ced my consciousness of the importance of the relatedness between what is and what was. I had the privilege of working with Jorge A. Figueroa, Executive Director and Chief Curator of the Museum of the History of Ponce in developing the exhibition. From him I learned more about the history of Ponce. Together we discussed the meaning of my work and explored related documents and artifacts from the Museum. As you will see, access to historical documents and artifacts provided a unique opportunity to articulate ideas about history. The old colonial mansion, which houses the Museum of the History of Ponce, also became part of the exhibition. The 19th century “Criolla” style rectangular and fan shaped wood lattice ventilators were often placed above doors to allow for air circulation. Rather than cover them. We incorporated them into the installations, enhancing the visual presentation and layering the projected meaning. In addition, we create rectangular floor pedestals and shelves to display the artifacts and historical documents. The use of the floor in addition to the wall spaces followed the tradition of African altars which are vertically as well as horizontally arranged (Romberg, 1998). The concept of confession is us-ed in the title and through-out the exhibition. For me, as the artist, confessions offer an opportunity to tell the story of the ancestors of the city. These are not the confessions located in a church where the penitent confesses his sins and is granted absolution by the priest. Rather this installation creates a site for “confession” in the sense of “avowal,” namely to declare who one is, and be granted affirmation by his community. What is affirmed is “a repository of a hidden, unwritten history that emerges from obscurity to be organized, codified and translated” (Figueroa, 2006). For Confessional – Installation I (2006), I designed a free-standing wall consisting of an open arch at the center with three triangular shapes each with a cross, suggestive of the Holy Trinity or perhaps the Tres Hercencias notion of Puerto Rican identity (Sundiata, 1997). Passing through the arch, one enters an open area symbolic of a sacred space with purple curtains and two Catholic like confessionals. The chairs in each confessional were once used at the Our Lady of Guadalupe Cathedral in Ponce and are now part of the Museum of the History of Ponce’s permanent collection. People were invited to use the confessionals to tell their oral histories, which were videotaped at prearranged times. The people of the City of Ponce and other-s confessed stories of Taíno, African, European heritage. This process entailed the creation of a new understanding of colonial myths empowering us now and into the future. My Aunt Ketty, found a stone carving when digging the foundation for a house in Peñuelas. The stone carving conveyed tremendous power and serenity. I was immediately taken with the hidden aspects of our ancestry. I placed the carved stone on my altar. At that same time I had begun to study Tai Chi and connected the stone carving to Taoism based on a belief of the harmony of nature. The carving came to represent earth, fire, water and air, elements fundamental to life and sacred in most primordial religions. The earth was evident in the stone itself, compressed in the bowels of the earth thousands of years ago. The top of the carving seemed to represent a headdress, suggestive of power and emanating energy, which I translated as fire. I could see in the texture of the stone the effects of the water from the rain and sea. And if you listened closely, you might hear the breath of life from the nostrils of the stone carving. Several years later I painted the Spirit of Peñuelas, 1994, a sculptural rendition of the head of the carved stone. It appears in front of the horizon line, indicating that such spiritual force not only influenced the past but also can have a significant impact on the future. When looking for artifacts from the Museum of the History of Ponce to relate to the painting, I remembered the archeological excavations at Ti-bes. I was honored when I was allowed to use fragments of a Taíno skull and jaw-bone dating from 1200 B.C. to 600 B.C. for the exhibition. Removing the bones from the classification box I felt the connecting energy that reminds us of our roots. I decided to place the skull fragments on a low altar like floor pedestal beneath the painting. I framed the top of the installation with the rectangular wood lattice structure. With the Taíno artifacts anchoring the bottom, the painting of the carved stone in the middle, and the “Criolla” architecture at the top, the installation became symbolic of the layers upon which our culture is built. The combination of these evidences was meant to both offer an aesthetic image and tell a story about our history. One day I asked my grandmother if she would let me do some sketches of her altar. One of the objects was a statue of a North American Indian representative of the Puerto Rican Cacique. The painting, Cacique, 2003 developed from the sketches is dedicated to the Indio assistants. The Cacique wears a necklace made of teeth. He has multiple eyes to symbolize his role as the watcher and his ability to look at different dimensions (Bettleheim, 2005). He wears a crown of feathers representative of his power in relationship to nature. The outline of a hatchet across the face indicates the power to break bad thoughts or negative energy. Located in the upper right corner, the international transit symbol, a blue circle outlined in red with a red line through it indicates that something is prohibited and offers protection or perhaps a warning. I chose artifacts for the Cacique installation from the Centro Ceremonial Indígena de Tibes. The four polished and sharpened stones from 1200 B.C. to 600 B.C. evidence the activities of survival. I placed these polished stones into a cross shape on another altar like floor pedestal under the painting and framed the top of the installation with the wood lattice structure. The Spirit of Peñuelas and the Cacique installations positioned across from each other just inside the entrance to the exhibition pay homage and signify the presence of our Taíno ancestors. The concept of la Madama is rooted in religious beliefs brought from Africa and preserved in the oral traditions and spiritual practices of the syncretized religions that emerged in the new world. In Espiritismo, practiced in the south of Puerto Rico, la madama functions as a protector who maintains the African traditions and culture. The Madama manifests in much of my work. 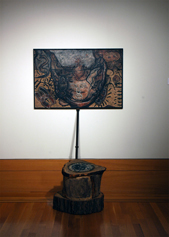 The head and bust of a Madama dominate the encaustic painting entitled Madama of the Shells, 1998. The orange and brown tones of the painting are sacred colors in Buddhism. The cowrie shells surrounding the madama’s head signal her as the bearer of riches. Cowrie shells were once used as currency in Africa and are instruments for reading the future in some religious rites. Shells and small transparent figures, representing spirits, float across the painting. For the installation, I asked a fisherman from La Playa de Ponce to collect conch shells. He gathered the shells from the island of “Caja de Muerto” by legend a burial ground for Taíno chiefs. Conch shells emit the deep-sea sound called “susurro” . Three shells were placed at the base of the installation, suggestive of the sea journey of the African Diaspora. The wood lattice ventilator in the shape of a Moorish fan called “Sol Trunco” from Islamic Africa adds another layer to the story of our culture. In many cultures cloth plays a function in spiritual rituals. The use of checker cloth reoccurs in my paintings as it does in Puerto Rican madama ceremonies. White represents purity, red cleansing, and blue spirituality. In the triptych Sacred Cloth, 1996 the cloth dominates the painting suggestive of yards of material. A metaphor for the complexity of the spirit world, the cloth obscures a figure of the madama, (slide 26). The painting integrates a horseshoe a symbol of luck on one side, and an obscured hammock on the other side. In Spiritist rituals, small hammocks, made of burlap, is placed under a home for protection and offerings. For this installation, I placed pieces of checkered fabric on each end of a long rectangular floor pedestal. The white clothe in the middle with a rusted horseshoe and glass of water on top offers a rendition of a Spiritista altar. Madama, 1985 part of a larger piece entitled “The Struggle Against Racism” was my first creation on the theme of the madama. The expressionistic relief sculpture was based on the vision of the African woman as a powerful warrior. The red and green colors, framing the top and the bottom of the piece, are the colors of the black liberation movement in the United States. For this installation, I decided to use madama dolls, which often sit on the altars or hang on the walls of homes throughout Puerto Rico indicating the central role of la madama in the culture. Sacred objects put inside the dolls offer protection for the individual for whom the doll was made. These two beautiful black dolls wear white dresses and turbans representative of spiritual purity and connection. A cigar tied with seven ribbons, the colors of the seven African deities is placed between the dolls on the floor pedestal beneath the relief sculpture. The Espiritismo tradition of smoking a cigar to connect to the spirit world is similar to the practice of smoking tobacco common in many Native American Indian tribes. The Sol Trunco, fan shaped lattice ventilator perfectly frames the top of the piece. The installation is opposite the entrance to the exhibit with the Madama welcoming the visitors. One morning my family and I attended a Yemaya ritual in La Playa de Ponce. Yemaya is the Yoruba goddess of the sea, presented as the Virgin Mary during the time of slavery as an act of religious and cultural resistance that allowed the slaves to camouflage there own religious beliefs (González-Wippler, 1987). During the ritual, participants dive into the water three times and then purify themselves with a twig while chanting. At the end of the ritual the participants depart without looking back leaving all negative energy behind. On our way home from the Yemayá ritual, we witnessed the Catholic procession of the Virgen of Carmen, patron of the sea. Fishermen take the statue into the water and around the bay of Ponce throwing rose petals in her honor. These experiences inspired the painting María del Mar (Mary of the Sea), 1993. The eight panel, encaustic painting depicts a female who could be la Madama, Yemaya, or the Virgin Mary coming out of the Caribbean Sea and facing La Playa de Ponce. It tells about the integration of Spanish Catholicism and African religions in our culture and of the role of the sea in bringing African and Afro-Caribbean beliefs and culture to La Playa de Ponce. For this installation, we used four wooden, hand carved statues of Santos dated from the 19th century. The santos came from Our Lady of Monserrate Church in Hormigueros, where miracles were said to have occurred. The Santos are significant. The Virgen of Monserrrate is one of the few black virgins in Catholicism. The second santo is Saint Martin de Porres. He was a dark-skinned half Indio monk. Other Dominican monks had made fun of him for being a mulatto. He was canonized a saint for his holiness and spiritual work in Lima Perú. The third santo is Santa Barbara. She was an early Christian martyr associated with lightning. Santa Barbara was used to re present the Yoruba deity, Chango, god of thunder and lightening. The fourth statue was of a small angel representative of the guardian. 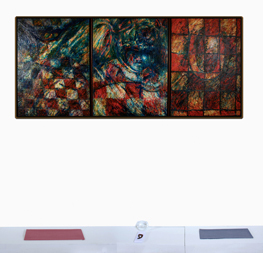 I placed the Santos in four display boxes mounted on the wall adjoining “María del Mar”. I gathered sand and shells from la playa reminiscent of the sea rituals. On the floor pedestal, I placed three vases filled with the sand and shells creating the base of the installation. The Sol Trunco, fan shaped lattice ventilator creates a half moon over the piece. I was invited to exhibit at the Center for Puerto Rican Studies in New York City. The space houses both a gallery and an archival library, I wanted the concept of books to be part of the exhibition and asked my wife, the poet mboncher, to write a piece for the exhibition. The poem entitled Keeper of History: Holder of Dreams, was born from a dialog between the poet and my mother and tells the epic story of my family’s reliance on the spirit world. I created a hand made artist book of the same title, which includes the poem and related digital images. For the seventh installation, I displayed the Keeper of History: Holder of Dreams artist book opened to the image of the sculpture of the freed slave. Above the artist book a monitor displays a video of the pages of the artist book downloaded from my website. The installation addresses the lost tradition of oral history, the dying tradition of the book, and the emerging ephemeral method of disseminating information. A monitor also displaying the video of the pages of the artist book was concurrently on display in New York City. While Artist in Residence at the Museum of the History of Ponce, I created the sculpture Ancestral Manifestations, 2006. Recovering from the fire in my studio in New York, I decided to work on something that symbolized rebirth, that would help me transform my experience. I took the opportunity to respond to the sculpture of the freed slave in the Park of the Abolition of Slavery in Ponce, which I had visited often while growing up. The monument, one of the few commemorating the abolition of slavery in the Caribbean, depicts the freed slave kneeling with palms opened to the sky. According to oral history, the chain around the wrists of the sculpture was cut in a clandestine act after the sculpture was installed. “Ancestral Manifestation” stands tall, the chain lies in a circle around his base. The sculpture, like a boat, is made of fiberglass and poly resin. Ancestral Manifestation holds a boat, bringing the people and culture of Africa to Puerto Rico. The figure jumping from the boat is based on stories told by my grandmother. He is swimming towards what lies ahead. Included in the installation are documents found in the Ponce Historical Archives and artifacts from the Museum of History of Ponce. The Register of Slaves from the Village of Ponce, 1852 lists the slaves of Ponce organized under the names of their owners and described using physical characteristics as if they were third person objects. Of interest, the book was rebound in such a way that information was cut and a block of pages were missing. The 1865 letters of the slave woman, Agripina argue for her freedom. The 1842 signatures in the Marcos Document list the names of those who paid for the freedom of the slave Marcos who earned their support by betraying the 1842 Slave Rebellion of Ponce. On the wall behind the sculpture are coffee sacks send when full by workmen like my father onto boats bound for Europe and the United States. On the ledge between the coffee sacks, I placed an old chain used on the sugar wagons as a reminder of that aspect of the colonial economy. While these documents and artifacts are powerful indications of the legacy of slavery in Puerto Rico, the message is transformed into one of strength. Agripina not only gains her freedom she becomes one of the grand-mothers of the Puerto Rican people. Ancestral Manifestation becomes one of the grandfathers, a gentle fellow whom one could imagine telling stories indicative of the African influence in the forging of a people. The installation Ancestral Manifestation retells the stories transforming the objectified into powerful actors. Keeper of History: Holder of Dreams was presented at the National Museum of Catholic Art and History, as a concurrent exhibition with Ancestral Confessions: Historical Evidence of a City. The two exhibitions linked East Harlem, the emotional home of the Puerto Rican Diaspora, with the island homeland. For over a half a century, these two centers of Puerto Rican culture have cross fertilized the traditions of the Puerto Rican people. The concurrent exhibitions, are intended to give continuity to the voices of the ancestors. As mentioned in the Seventh Confession, the transmission of the pages of the artist’s book at each exhibition makes the connection obvious. The Internet Installation in the New York exhibition consists of several elements. A metal church bulletin board case discarded in 2000 from Santa Cecila’s Church frames the monitor. On the floor pedestal partially burned Santos, remnants from the al-tar in my studio including a crucifix, a gold Buddha, a Cacique, an Elegguá, and a statue of the Virgen of Copper is sit on top of the international symbol “prohibit”. The monitor installation at the National Museum of Catholic Art and History was created from objects embedded in the history of Puerto Ricans in East Harlem. These objects tell about how people forced into economic migration survived and stand strong. The Internet transmission records the story. 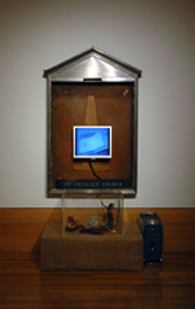 Confessional Installation II, 2006 is a symbolic representation of a “confessional” constructed from “found objects” also rescued from the re-no-vation of Santa Cecelia Church. 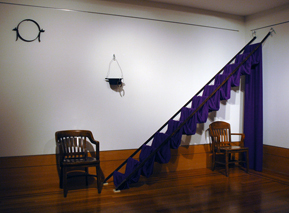 A fire escape ladder with yards of purple cloth constitutes the structural configuration of the confessional. Fire escapes functioned to provide evening reprieve from the hot summer tenements of East Harlem. In this installation, one could imagine Puerto Rican families on the fire escape or sitting on the two wooden chairs, talking about the day, telling stories or trying to make sense of their new life in the City. A cast iron pot used to burn incense in rituals and a metal clamp from a chim-ney flute hang on he wall behind the chairs. 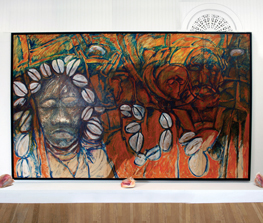 Keeper of History – Holder of Dreams, 2004 a large eight panel charcoal, woodcarving, and drawing of a Madama superimposed over a topographic back-ground was created in conjunction with the poem of the same name. A silhouette of la Madama, the protector, the keeper of the history, dominates the piece. She is depicted with syncretic spiritual symbols enclosed within her body. The head of the silhouette of la Madama represents a temple of tranquility and deep meditation. The silhouette contains an image of my father over a gravestone with the date of his death. Flowers and plants frame his torso. The silhouette also contains an image of a madama,” holding a broom with a map of Paris on the top. 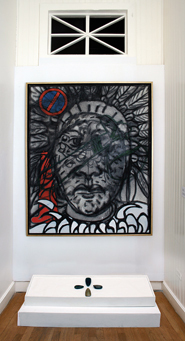 Placed in the center of the silhouette, like a heart, is the international transit symbol “prohibit” suggesting as in other pieces the need to protect, in this case the oral history and tradition. An atmospheric representation of the topographic map of la Playa de Ponce emp-ties into the Portugués River. The river is a place of great spiritual intensity and the site of numerous Spiritist rituals. The four images, at the top of the drawing above the silhouette, symbolize elements often found on the altars and used in spiritual celebrations. Globalization, Post-Industrialism, and Syncretism was produced in Paris in 1999 during the days immediately following the death of my father. It is a sixteen panels work rendered in encaustic and charcoal. One section features the image of my father, drawn from memory and filled with emotion. It pays tribute to him and his Taíno ancestry. The second section features a nocturnal image of a Madama carrying a broom whose bristles take the shape of the city of Paris, the woman welcomes the viewer with the words Bon Soir. She carries a basket decorated with a rosary and cross and filled presents. The Installation Syncretism, 2006 begins in the corner with a hand made flute and a number of staffs used in church processions. The main components of this installation consists of three tree trunks, a wood staff, and a charcoal wood-carved drawing. On the smallest of the tree trunks is the image of an African woman -- who represents all African women. The drawing on the wall contains the symbols of three female saints in the Christian tradition: Saint Claire, represented by a lantern bringing light; Saint Lucy, represented by the eyes she sacrificed for her faith; Saint Martha, represented by a torch and holy water sprinkler. Additionally, there is a snake that alludes to Eve, the “First Woman” as well as a pair of intertwined horseshoes. Those symbols surround a figure of Elegguá. He has shells for eyes, nose, and mouth. Elegguá is one of the Yoruba Orishas who is “keeper of the way” and “granter of happiness”. Above Elleguá is the “Sacred Heart,” the great Christian symbol for Jesus. All of these symbols are held in a hammock, a symbol of hope. One function of the artist, like that of the archeologist, is to discover, investigate, extrapolate meaning, and offer a reconfigured perspective on what has been left behind as artifacts. I hope that this presentation has given you a sense of my work as an arteologist. I have been blessed as a Puerto Rican with a rich religious, cultural, political, and familial heritage. This heritage invites curiosity and investigation. These are the factors that interest me and through which I express my creativity. These are my lenses through which a discarded fire escape ladder becomes the central component of a confessional installation. These are the memories embedded in my paintings, drawings, and sculptures. This is the life energy manifested in the archeological artifacts, historical documents, and found objects. My work attempts to apprehend, reconfigure, and re-contextualize these elements. It manifests as installation altarpieces that depict layers of experiences and culture. The installations, like my quest, are offered not as a product but rather as a process. The ongoing quest for meaning defines us as human and allows us to nourish and nurture each other and the life we share. It allows us to connect to the roots of our civilization and spirituality. The fire in my studio, which precipitated the exhibitions I have shared with you, did much more than enhance my consciousness of the importance of historical memory and artifacts. It reminded me of the importance and the obligation to pass on what we have learned and discovered. Deconstructing the threads of religion, history, art, culture, politics, and oral histories strengthens us as part of the chain of history. Becoming a link in that chain is as important as cutting the chains of slavery. I hope that this humble presentation encourages us to reflect on and enhance the celebration of who we are and where we came from. Let it motivate us to become powerful actors. Bassani, E. (2000). Sculpture Luba. In Sculptures: Afrique, Asie, Océanie, Amériques, Catalogue (pp.188-190). Paris, France: Reunion des Musees Nationaux. Bettelheim, J. (2005). Caribbean Espiritismo altars: the Indian and the Congo. Art Bulletin, 87(2), pp. 312-330. Denis, L. (1955). Después de la Muerte: Filosofía de los Espíritus. México: Editorial Orión. Droogers, A & Greenfield, S. (2001). Recovering and Reconstructing Snycretism. In Adres Drooger and Sidney M. Greenfield (Eds. ), Reinventing Religions (pp. 21-43). Lanham, Maryland: Rowman & Littlefield Publishers, Inc.
Gonzáles, J. L. (1995). The four-storeyed house: Africans in the forging of Puerto Rico’s national identity. In Darien J. Davis (Ed. ), Slavery and beyond: The African impact on Latin America and the Caribbean (pp. 173-193). Wilmington, DE: Scholarly Resources Inc.
González-Wippler, M. (1987). Santería: African Magic in Latin America. Bronx, NY: Original Publications. Huntington, S. P. (1993). The clash of civilizations. Foreign Affairs, 72(3), 22-28. Kardec, A. (19510. El Libro de los Espíritus. México: Editorial Orión. Molina, M. N. (1996). Archetypes and spirits: A Jungian analysis of Puerto Rican Espiritismo. Journal of Analytical Psychology, 31, 227-244. Romberg, R. (1998). Whose spirits are they? The political economy of syncretism and authenticity. Journal of Folklore Research 35(1), 69-84. Pérez Y Mena, A. (1996). Cuban Santería, Haitian Vodun, Puerto Rican Spiritualism: A multiculturalist inquiry into syncretism. Journal for the Scientific Study of Religion, 37(1), 15-27. Pérez Y Mena, A. (1991). Speaking with the dead: Development of Afro-Latin Religion among Puerto Ricans in the United States. New York: AMS Press, Inc.
Shaw, R. & Stewart, C. (1994). Introduction: Problematizing syncretism. In Charles Stewart and Rosalind Shaw (Eds. ), Syncretism/Anti-syncretism:The politics of religious synthesis (pp.1-26). New York: Routledge. Sundiata, Ibrahim K. (1997). Puerto Rico and Africa: The ambiguity of diaspora. 21st Century Afro Review, 3(1), 1-36. Thompson, R. (1984). Flash of the Spirit: African and Afro-American Art and Philosophy. New York: Vintage Books. Werbner, R. (1994). Afterward. In Charles Stewart and Rosalind Shaw (Eds. ), Syncretism/Anti-syncretism: The politics of religious synthesis (pp. 212-215). New York: Routledge.